Look out for amazing deals with these brands: VNC, So Fab, The Ramp, Gold Dot, Cole Haan, Barbie by Shubiz, Figlia, Vibram Five Fingers, Crocs, Cushe, Hush Puppies, Sebago, Adidas, Suelas, Marengo, Cole Vintage, Trunkshow, Republic, Marc Ecko, Zoo York, And1, Gola, and GBX. 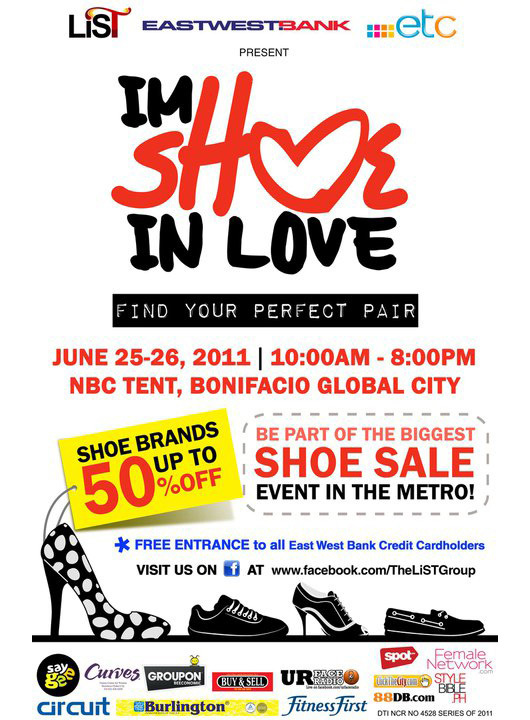 These are just a few of the great deals you’ll find at the biggest shoe sale event in the Metro! For the full list of participants and other info, visit I’m Shoe In Love’s event page here or The LiST Group’s fanpage here. And because I know there’s a lot of you shoe fanatics out there, I’m raffling off 20 tickets to the first 20 people to leave a comment below with their names, Twitter names and Google Friend Connect usernames. Remember, you have to follow me on both Twitter and Google Friend Connect in order to qualify.